Siirt and Likhnyk blankets are woven inside the territories of early steppe nomads. Woven blankets that are then teased into a matted felt like finish resembling animal hides. The lizhnyk pummeled first by the power of water inside a Valylo before being treated with a teasle to raise the nap. A throwback to primitive techniques, these two blankets are still made today in the Ukraine and Turkey. Lizhnyk and the other long-piled Ukarainian primitive rug the "kover or kots". In the Ukraine a knotted long-piled rug tradition exists. Knotted rugs with long pile known as the kover or kots were woven in the Ukraine up to the nineteenth century, resembling Tulu from Anatolia and other eastern European long-piled rugs. A completely different technique is used to create the kover or kots by comparison to lizhnyk's woven by Hutsuls in the Carpathian mountains. The lizhnyk is a flat weave which is then felted by the action of water in a valylo. These two types of long-piled weavings from the Ukraine are so distinctly different, their early origins are brought into question. One has long knotted pile, the other felted faux long-pile. Knotted long-pile carpets known as the kover, kots, or koberets were described by Vasyleva in Embroidery of Polissya, Artistic Fabrics, Carpet-Making, "Kover, kots, koberets were fabrics with long sheared nap. In the process of their manufacture special knots of colored wool were tied to warp threads, with their subsequent shearing. Owing to that the pattern was created only on the right side. The pattern's character depended on the height and thickness of the nap." According to Vasyleva these long-piled weavings were used by the "well-to-do population" for wall decoration also serving as insulation. Vasyleva states that home production was to satisfy the needs of the general population with workshop production creating more expensive versions.1 The Permanent Representative of Ukraine to the Council of Europe advises that "kots are handmade in the western, mainly Hutsul region".2 Outside of the Ukraine these kots or kover long-piled knotted primitive rugs are almost unknown. Confined today to the Carpathians, Nykorak contends that, "long - piled carpets" called lizhnyk were woven all over the Ukraine before the end of the 19th century. The kover or kots were also widespread throughout the Ukraine up to the end of the nineteenth century. Nykorak also refers to surviving lizhnyk production in the Carpathians, "before the end of the 19th century lizhnylc were spread and produced all over Ukraine, having survived in the Carpathians only. "3 The valylo a key requirement in the creation of lizhnyk could be a factor in lizhnyk resurgence in the region. Architectural relics, valylo need to be in working order so that the fibres of the lizhnyk can be successfully matted. Revival of lizhnyk production during the twentieth century is reminiscent of the story of siirt blankets produced in the province and town of Siirt in Eastern Turkey, as well as alpujarra inlaid loop pile rugs from the province of Granada Spain, all serving the tourist trade in their respective regions. Once widespread throughout all of the Ukraine, the need for shaggy, warm woollen textiles was met by both home and workshop production. The kots or kover appears to have been relegated to the history books with production ceasing sometime late in the nineteenth century. The lizhnyk remaining a favourite with production continuing today, preserving along with it the practice of felting woven items with the action of water in a valylo. Read more on Kots click here. For further information on the valylo, you can also use the keyword Валило. Thanks to T. Kara Vasyleva and Olеna Nykorak we can gain some further insight into the production of these obscure weavings. "Carpets produced at home were aimed at satisfaction of population's needs. The first guild organizations emerged in Ukrainian towns in the XIV-XV centuries, in the XVI-XVII centuries their activity reached its peak, and since the XVIII century weaving manufactories [sic] started to develop actively. They emerged on the basis of carpet-making workshops, which were attached to landowners' estates. At the olden [sic] times depending on the manufacturing technique and functional purpose carpet ware in Ukraine had different names: kover /carpet/, koberets, kots, nalavnyk /bench top cover/, kylym /carpet/, etc. The most ancient name is "kover", since the XVI century the names "kots", "lizhnyk" were spread. The name "kylym" /the present Ukrainian word for "carpet"/ appeared in Ukraine at the beginning of the XVII century. Kover, kots, koberets were fabrics with long sheared nap. In the process of their manufacture special knots of colored wool were tied to warp threads, with their subsequent shearing. Owing to that the pattern was created only on the right side. The pattern's character depended on the height and thickness of the nap. Such manufactured articles cost much, they were mostly used by well-to-do population for the purpose of heat insulation and decoration of walls. Lizhnyks made of coarse threads were very widespread. Nalavnyks - long narrow carpets having crosswise or lengthwise ornament - were also in demand. Carpets proper were used first of all to decorate the walls, as well as to cover tables, benches, chests. Weavers paid special attention to their ornamentation; it was the ornamentation that most fully showed the taste and the skill." 3. Olеna NYKORAK Shevchenko Scientific Society Lviv Traditional Ukrainian Lizhnykarstva 1995 "The 16-17th-century archival and other data give us evidence about the production of lizhnylcs (home woven thick woollen long-piled carpets) in the Ukrainian Carpathian region, Bukovyna, Volynia, Polissia, as well as in the Chernihiv, Kharkiv, and Kherson regions. On the basis provided by the field exploration data, gathered by the author herself, and the examination of the museum exhibits, the author contends that before the end of the 19th century lizhnylc were spread and produced all over Ukraine, having survived in the Carpathians only. Since the turn of the 20th century in Hutsulshchyna, and since the middle of this century, in Boikivshchyna, the koverets (a patterned lizhnyk) came into production alongside with the achromatic, polychromatic, striped and one-colour lizhnyks, already in common use. Its most characteristic patterns are geometrical: transversely striped, net-like, and medallion-shaped. Nowadays the most ingenious compositions of lizhnyks and lizhnyk-like chair-covers are designed after typical Hutsul embroideries and cloths." Lizhnyk are said to be self born - samoridny, shorn from the back of sheep, vigorously washed wool is loosely spun then carefully woven. Plunged into a hole in the river bed, forces of nature act on every fibre, fast running water guided by a water wheel pulverise the lizhnyk creating a matted felt like finish. The resulting imitation fur lizhnyk is dried in the sun then both sides are teased and combed to achieve the final effect resembling a hairy primordial faux beast from the wilds of the Carpathians. Unique in shaggy rug weaving worldwide the lizhnyk bears the hallmarks of being truly samoridny. The combined effects of loosely spun thick wool wefts, their subsequent punishment in the valylo and final teasing of the fibres resulting in a furry matted animal fur-like product is not only ingenious but practical in it's many uses. No where else has the wool of sheep been rendered in such bestial form, a true primitive rug type. Lizhnyk blankets could be considered as woven felts, see the post titled "woven felt" for more on the valylo - lizhnyk woven felt connection. The Lizhnyk illustrated is small measuring only 127 cm x 70 cm. the colours are all natural. The colours are all natural sheep wool from the Carpathians. Origins of the Hutsuls are clouded. Sarah Johnstone and Greg Bloom in their book "Ukraine" give the following description "They were first identified as a separate ethnic group at the end of the 18th century. According to some accounts, the "Hutsul" encompass several tribes - including Boiki, Lemi, and Pokuttian - so who and what they are is open to some interpretation. Ethnographers describe Hutsul life as dominated by herding sheep from high mountain pastures (polonyny) to lowland fields, with a little agriculture and forestry thrown in. They point to a dialect incomprehensible to other Ukrainians." 3 Another account has Romanian shepherds in the 13th and 14th centuries wandering with their flocks moving along the Carpathians into what is today the Ukraine. 4 Wikipedia records their origins in the Slavic kochul - "wanderer","migrant", in reference to their semi-nomadic lifestyle, to the name of the Turkic tribe of the Uzy.5 Shepherding and the nomadic life of heading for high ground in the summer and returning to lowlands in the winter are synonymous with long piled primitive rugs. Early shepherds settling in the Carpathians could have brought with them weaving traditions passed on through generations of nomadic ancestors wandering through time and space. Lizhnyks are woven on handmade wooden looms. With deep respect for tradition the primitive looms are created with as much care as the lizhnyks themselves. The process of weaving begins with the selection of the highest quality local wool which is then washed. 6 Spinning wheels, vereteno, are employed to spin the wool. 7 Wool for the wefts is loosely spun and woven into a weft faced plain weave, this allows for the subsequent "softening" of the wefts in the valylo. Many different sizes and formats are produced from small items up to large bed covers to ward off the bitter cold of Carpathian mountain winters. After the lizhnyk is woven it's taken down to the nearest stream and plunged into the "valylo". 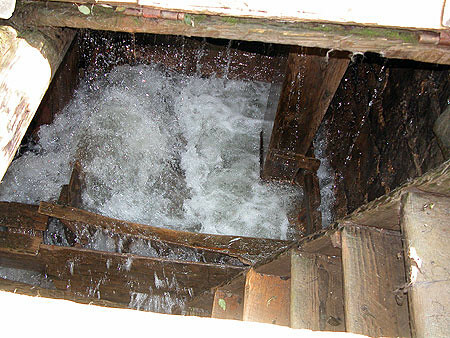 Water is channeled along the stream in a wooden structure known as a "dzholob" . Water gains momentum for some distance before it smashes into a water wheel inserted into the valylo. The lizhnyk is churned about in the valylo, also known as Валило, until the loosely spun wool wefts take on a felt like consistency. Once this intensive process is completed the lizhnyk is retrieved and dried in the sun. The final hairy woolen form of the lizhnyk is created by combing the rug in a similar manner as Anatolian and North West Persian blankets named after the town of Siirt in South Western Turkey. 8,9 Lizhnyk fibres are teased up forming a nap on both sides unlike the siirt's where the nap is only teased up on one side to form a raised design. The year 1515 is the earliest date where the use of the valylo is recorded. The method was known to ancient slavs in the 1st and 2nd centuries AD.10 Variations exist in the description of the process at the valylo, some simply describe this as a hole made in the river bed where the fibres of the lizhnyk are beaten until soft. Take a tour of the numerous small museums of the Carpathians, littered with examples of lizhnyk's, hung on walls, draped over chairs and on the floor. Alongside the many lizhnyk's are historic hand made looms. Recently lizhnyk's have appeared in the international market in many varied colours, some with brightly dyed wool and others using all natural wool to form the diamond shaped patterns. Sometimes mistakenly referred to as Indian blankets. For many examples of early Ukrainian weaving visit the The State Museum of Ukrainian Decorative Folk Art. The Museum Circle of Prykarpattja consists of many small museums housing examples of Lizhnyk's and looms. Of particular note is the Museum of folk art of Hutsulschyna. The Ukrainian Museum and Library of Stamford contains many historic photographs of the Carpathians and Hutsuls at work and play. Next time someone's ill or it's cold at your place consider the magical and warming properties of the samoridny lizhnyk, the self born rug from the Carpathian mountains of the Ukraine. 8. "Valylo" Etnostyle. Web. http://www.flickr.com/photos/ethnostyle/5242003205/ With thanks to Lilya from Etnostyle for describing the process by which lizhnyks are felted using the Valylo and the final stages of drying and further teasing of the nap. 9. Wertime. J Back to Basics. Primitive Pile Rugs of West and Central Asia Hali 100 1998 pp.86-87. 1961 and transferred to Yavoriv secondary school in 2004.
room with the area 36 sq.m. There are 255 main exhibits.